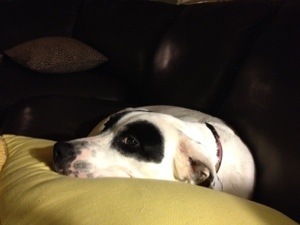 … doesn’t realize this is the last night she’s going to spend with me for about six months. I was dozing on and off, trying really hard to get to sleep, when it suddenly hit me… Oh no! My Trixie! Instead of having her sleep at my feet like usual, I called her to come up and lay beside me. Now she’s snoring peacefully with her chin on my belly but I’m in tears. Such perfect love we get from animals. This entry was posted in Uncategorized on February 28, 2013 by justbunny. Awww, Trixie! She’ll be waiting for Mommy! 🙂 Home support team! I have thought about Trixie a time or two lately and wondered what would be happening there. I can’t imagine how hard that will be. It is truly perfect love – unconditional in it’s truest sense. are you going to be able to go to fest this year or is that an unknown? I have every intention of making it to fest but I’ll need to get creative with finances to swing it. I cannot miss our annual migration with my tribe! Trixie will be ecstatic to see you once again! and you will be in GREAT shape to hike with her! !